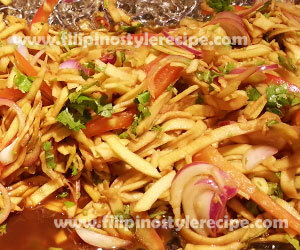 Filipino Style Recipe: mango salad is another type of salad made of unripe green mangoes, tomatoes, onion and cilantro then dressed with fish sauce and lime juice. Mango salad is a simple and easy to prepare that is commonly serve as appetizer or side dish specially during summer season. 1. 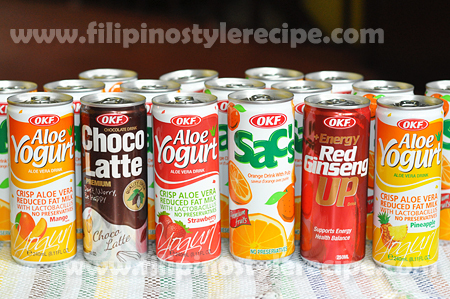 In a bowl, combine salad dressing until well blended. Set aside. 2. 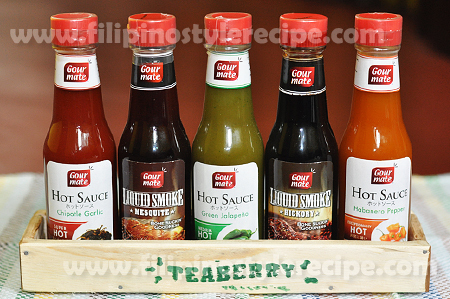 In a large bowl, mix all ingredients then pour salad dressing. Toss to combine then serve. 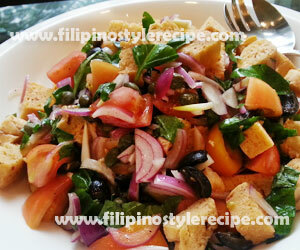 Filipino Style Recipe: Panzanella is another type of salad made of bread, tomatoes, onion and basil then dressed with olive oil and vinegar. Panzanella salad is a simple and easy to prepare which is ideal for those on diet and health-conscious. 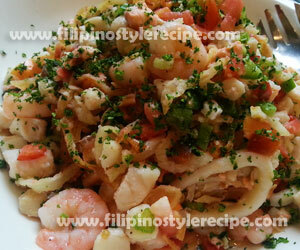 This dish is popular in Italy and commonly serve as appetizer specially during summer season. 1. In a separate bowl, olive oil, garlic, vinegar, sugar, salt and pepper then mix well. 1. In a bowl, combine croutons, tomatoes, onions, capers and black olives. 2. Pour dressing over the salad then toss and set aside for 20 minutes. 3. sprinkle basil then toss again before serving. 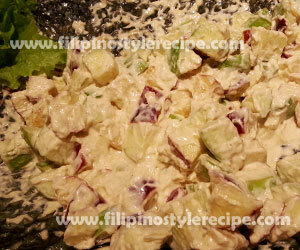 Filipino Style Recipe: Waldorf salad is made of fresh apples, celery and walnuts tossed in mayonnaise then served with lettuce. This salad was created at the Waldorf Hotel in New York city and usually served as appetizer or light meal. 1. In a bowl, combine mayonnaise, lemon juice, milk, sugar, salt and pepper then mix until well combined. 2. Add apples, celery and nuts then toss until coated. 3. 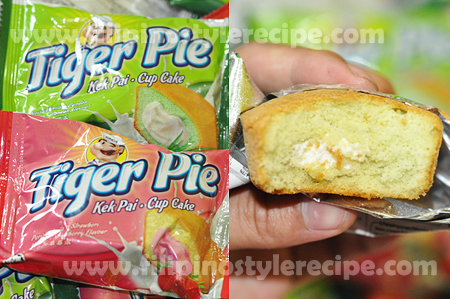 Cover and refrigerate for 30 minutes then serve with lettuce. 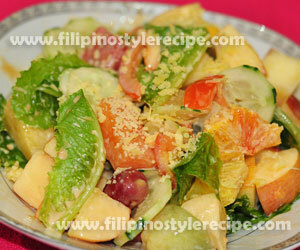 Filipino Style Recipe: Fruit and vegetable salad is a simple yet healthy dish that is commonly serve as appetizer. 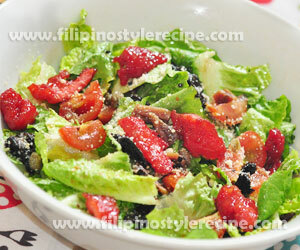 This dish is consists of mixed fruit and vegetable then toss in salad dressing. 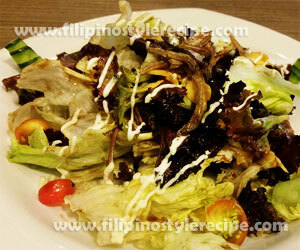 Fruit and vegetable salad is ideal for those on diet and health-conscious. 1. In a large bowl, combine fruit and vegetable. 2. Pour the salad dressing over the fruit and vegetable then toss to combine.